We've got a very special dog who is scheduled for surgery in two weeks and needs your help! Below is a brief summary of her story. You can see more details and how to donate here. Ruby came to RCHS in very poor condition from a hoarder/breeder home 6 months ago. Although it was known from the time of her intake that she has severely deformed front legs, Ruby had a very long way to go before she would be a good candidate for the surgery required to fix her legs. During her time with RCHS she has gone through extensive rehabilitation, including proper nutrition in order to bring her up to a healthy weight. Her veterinary surgeon has determined that Ruby is finally ready for surgery! This is where you come in. 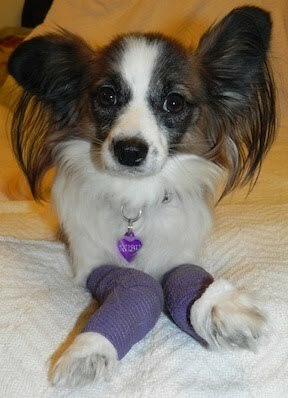 Her surgery will cost $6,000 total ($3,000 per leg). Each leg will require a separate surgery at different times in order to allow proper recovery and rehabilitation. At this time we are hoping to collect $3,000 for her first surgery. Please help us help Ruby. Thank you for all of your support. Without all of you, we would not be able to help the hundreds of animals we care for every year!